Elvis and Princess waiting (impatiently) to be fed. Every family is different and I’m sure that is not news to anyone. If you were raised by wolves in the jungle your family still had it’s traditions. There will be some who just insist on doing things their way. In the public school system or the military once an aggregate becomes a group you will see these folks start popping up. Our family is, perhaps, more involved than yours. 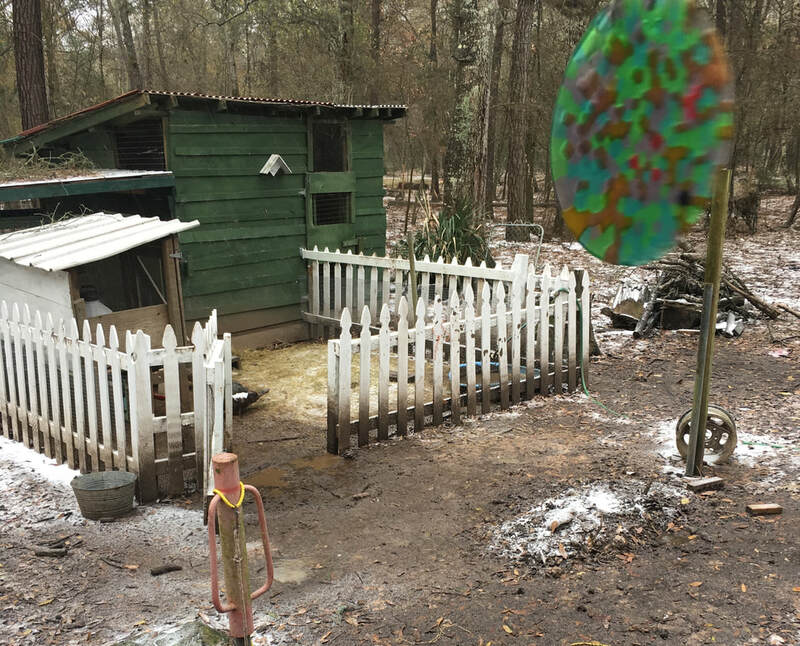 We feed about 3 times daily (winter) to a family with over 50 members that include six different species. All of them try desparately to get along while meeting their own needs. Sometimes that means it is loud. Sometimes it is comical. It is always (to me at least) interesting. These two are just full of pride. They are pretty certain that feeding is just for them and cannot understand why these lesser beings (non-equines) are allowed to eat at the same time. I allow for idiosyncrasies but almost all the outdoor critters eat the same food. We do not sell eggs and it makes little difference to us whether a bird is a champion layer or just holding on to a place at the table. 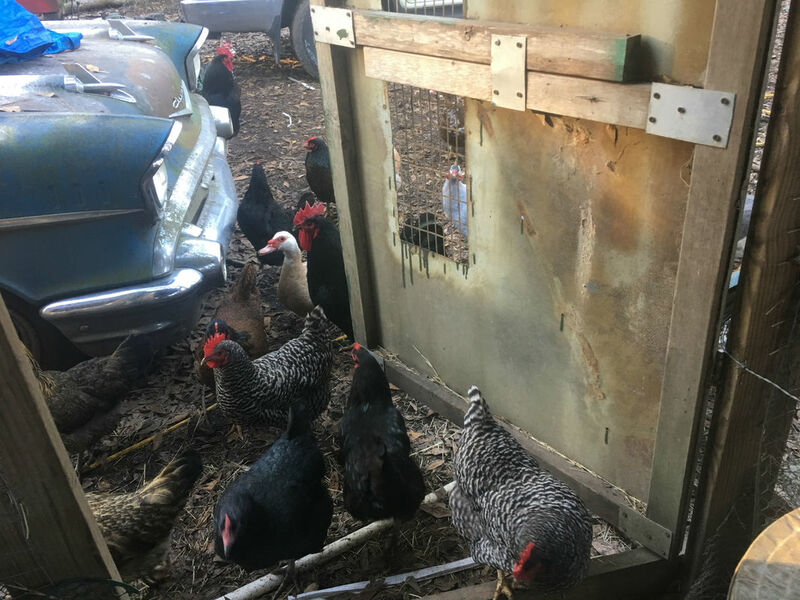 Free ranging chickens do not seem to have a long life span with raccoons about. We protect them but to be free-ranging, by definition, you have to range. What we try to do is provide a safe place to roost and enough to eat. For the most part we seem to be accomplishing that fairly well. Nobody gets a menu. This is what's for dinner. Egg laying mostly happens when the weather is not extreme. Extreme heat or cold weather cast the same pall over production. In East Texas it’s obvious that the heat has the most impact. We do not feed a layer mix. I do not recall ever having a sick chicken or duck and to me that is far more important than an abundance of eggs. ​I throw the corn into the barrel with the “all stock” feed that I use. Some of the brands of all stock" may have a higher percentage of sweetness listed but they all seem to work well. If they don't like it they can eat grass or weeds. By the way, they do, as well as bugs (thankfully). I am the center of attention when I am mixing or passing out this food. When it’s all said and done one scoop of corn sweetens 4-5 scoops of all stock and that’s enough to feed everyone. This mix provides some variety and helps everyone zero in on the feed I throw out. That is especially important at night. ​I probably shouldn’t say this but it’s been a while since anyone broke out because of the green grass on the other side of the fence. Happy critters tend to stay at home. 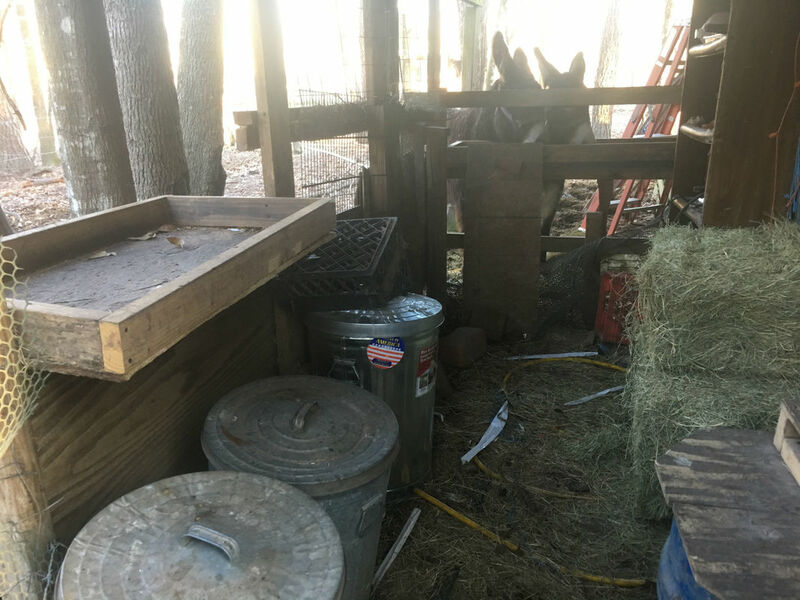 This little space serves for storage and dispensing of all hay and feed. It does an outstanding job of keeping it dry. As you can see the door was created with the most stylish scrap air conditioning panel that I could find. There is also a limo parked right outside. Nothing but the best. 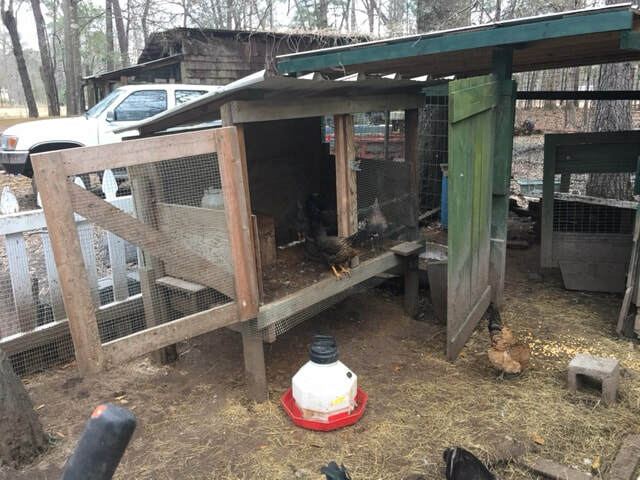 Chickens and ducks have no manners when they are waiting to be fed. They are loud. There is no place for me to hide. Due to the donkeys being unwilling to share and my desire to consolidate the feeding area I am going to have to revise this room. Feathers must eat separately because Elvis and Princess insist that he is a little cretin deserving no place at their table. Actually I have always thought 3 was a bad number for dogs. Seems to be for donkeys too. Two of them bond and the third one is out. Doesn't help much that Elvis and Princess are siblings and as close as any I have ever seen. Feathers, the mini donkey, also needs a lower table. These birds are loud but not nearly so loud as a donkey. Throwing feed on the donkey's tray is just like hitting a mute button. In the morning I generally throw their feed down first just to get a little peace and quiet. In the evening putting the ducks away is more important than peace and quiet. Who else has a picket fence for their ducks. In the evening the ducks trump everyone. It is my job to get them inside the picket fence. I make a quacking sound and they get all excited knowing they are about to get fed. I do not think they are mistaking me for a real duck but they know with absolute certainty that feeding waits inside the picket fence. I suppose a stranger might find it very funny to see an old guy quacking like a duck. Doesn't matter to the ducks or me. We know what is happening. Jail break One of the "chucks" getting ready to bail out. I’m certain that you have heard the phrase “we are like sitting ducks here”. That has to be is talking about runner ducks. They do not fly and I can outrun them. If you know me you know that is slow. They probably should be called "fast-walker ducks." For the present I just put them inside and close the gate. That is truly not safe enough and pretty quickly I will see to it that their guts lead them into a safer environment. When I have predator-proofed just a little more, I will throw the feed into the inner pen that you can see behind the green door.. If you feed the birds or donkeys first the runner ducks get distracted and try to join them. If the ducks are first they march to the pen with a purpose and it’s hilarious. Their marching music is performed mostly by donkeys whose brays insist that mere birds are unworthy of being seated at the head of the table..
​​I intend to get some more non-flying ducks (khaki campbell) but I will buy a baby male goose with them. Hopefully the next one won’t play in traffic or keel over dead like the last one did. They tend to be excellent for flock protection. ​By the way that is one of the chucks standing in the door of the starter cage preparing to seize the day. This was taken on the day I realized that they were as tall as their duck mother. Chicken-duck=chuck. Click here for story: Motherhood, or something like it Babies are the exception to my rule that everybody eats the same stuff. For about a month they eat flock starter crumbles. Then they go to half crumbles and half adult food. They were two months and two weeks old when I cut them loose and had been eating like everyone else for perhaps a month. Feathers, our elder statesman waiting to be fed. 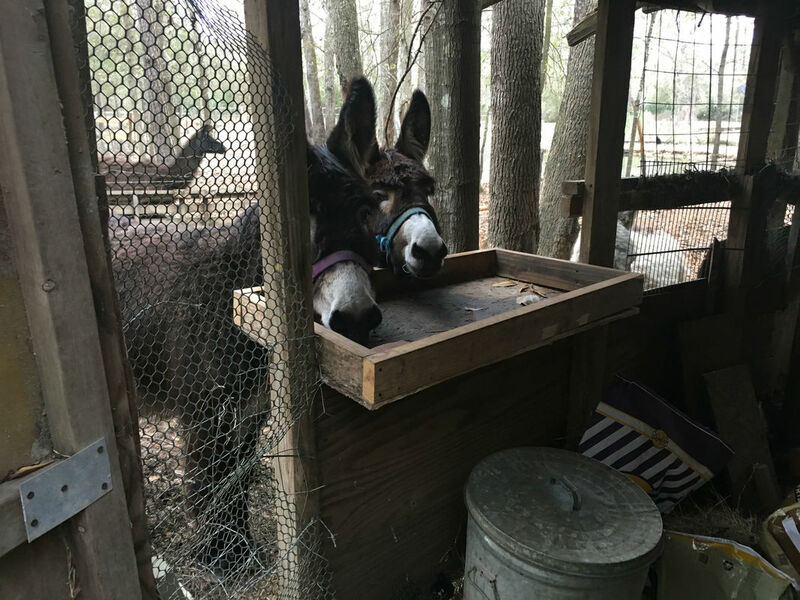 Feathers gets his special feeding tray because the other donkeys do not tolerate him. He is a good boy and willing to share. ​He is the quietest of the donkeys and is fed with a little wall between him, the goat, and the llama. That will continue but I am going to rearrange things in the feed lot. More on that later. 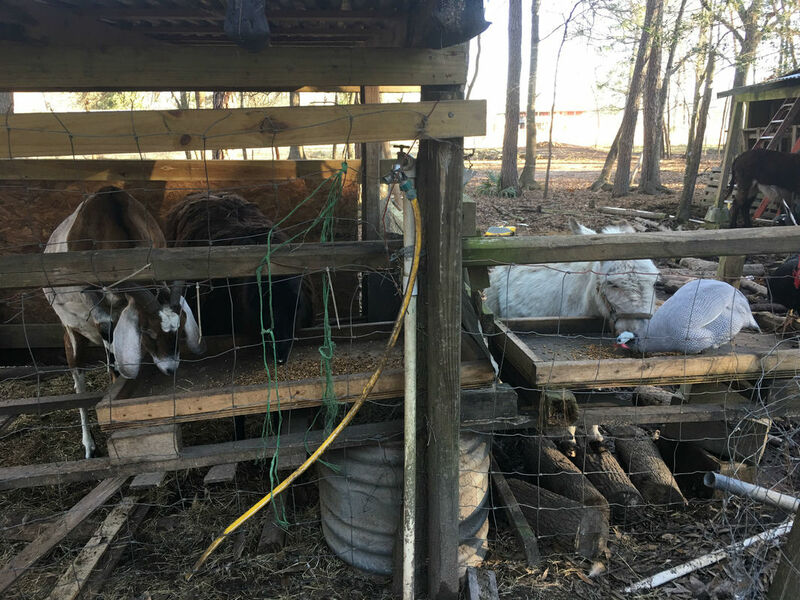 Beau the goat, Hershey the llama, Feathers the miniature donkey, and an unnamed guinea fowl. You can hardly see Hershey the Llama but he is standing beside the goat. You will notice that there is a guinea fowl on Feathers' feeding tray. There is another just off camera. I always thought the guineas were a little short on brains but that isn’t true in this case. When feeding they let the others fight over the food and they go share with Feathers. So at night the ducks trump everyone but in the morning the donkeys eat first. After all I had more than my share of noise when I was a teacher. Following them I feed the rest of the family and that quiets down the barnyard. I have found that in the interest of reducing conflict it is better to dribble out the feed over a 20’ path. Just throwing it is like putting 20 kids at a table for four. That's also how you make a llama spit. Just throw his food in a common pile and he will try to own it. No arguments when you make a space at the table for everyone. In the morning I throw feed in the pen for the runners and leave them for a few minutes. Otherwise they frequently bolt for the pond without eating. It used to surprise me that that sometimes they would rather swim than eat. That generally seems to be the case in the morning. In the evening their guts are in charge. So much for the little choreographed dance that feeding has become. It took a while to figure out what everyone needed or wanted. Once you know that, you have the secret to keeping order and reducing escapes for greener pastures.